The term Plastics, as is the case in Bass fishing, refers to an imitation bait made from certain plastic compounds that are usually, but not always buoyant in water. They come in all colors including glow in the dark neon’s, can also take on and retain you favorite flavors & attractants that make them even more effective as a carp angling hook bait. In the carp angling world, these plastics are designed to mimic particles (Corn, Maize, Garbanzo Beans, Tiger Nuts, Hemp seeds, pellets and even maggots/grubs etc.) and can be used by themselves or as a counter balance in combination with a "real bait." Initially devised to replace a "real" bait on the hook or hair to stop crayfish and smaller fish from nipping away at the bait or even stealing it completely; there are now many advantages and bait presentations created by very creative anglers. 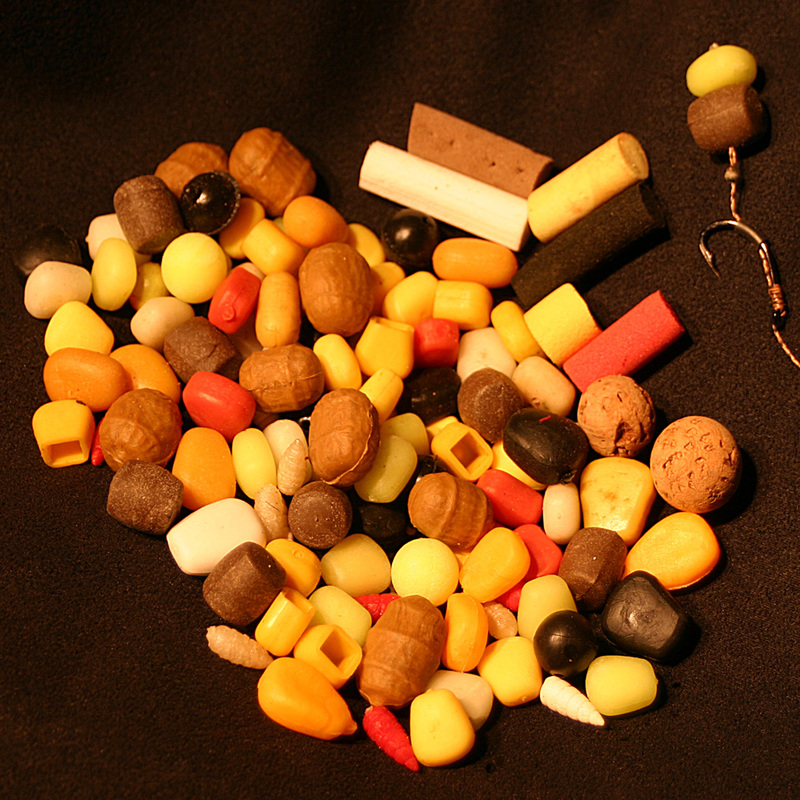 By using plastics as your bait or part of your hook bait presentation you are guaranteed that there will always be a bait on the hook regardless of how long you have the bait in the water while waiting for a bite. To our mind, the main advantage of using plastics is that you can use them to counter balance the weight of the hook thus creating a "critically" balanced hook bait. This means that the baited hook has a neutral weight in the water and so will act very naturally either on the bottom of the lake/river or indeed, even popped-up off the bottom as needed; for example, when fishing over a bed of weed or even further up in the water column. Whether fished as a single hook bait without any additional pre-baiting, used to tip a conventional bait off or in conjunction with a method or pack ball, there is no doubt about the fact that plastics work very well and definitely worthy of a place in your tackle armory. Carp are inquisitive creatures; a brightly colored plastic can stand out over a dark lake bed or indeed a bed of "free bait" offerings and so will get noticed by the carp, possibly even more so if is flavored too! • The critically balanced, baited hook now weighs very little and thus both presents itself and acts just the same the surrounding areas' "free bait." The feeding carp may. • The hook bait gets inhaled or sucked in by feeding carp to be tasted along with any surrounding food items (your method mix, pack bait balls or scattered loose feed etc.) with minimal to zero resistance. • If your rig has been constructed effectively with a sharp hook and "honed in" to suit the particular fishing situation you find yourself in, you will find that 7 or 8 pick-ups out of 10 will result in a hooked carp running and sounding your alarms. The 20 or 30% of the pick-ups that don't result in the run will be down to carp realizing that something isn't "right" with the bait attached to a hook and manage to quickly spit or blow the bait out of their mouths without getting pricked by the hook. The more baited hooks any one carp gets to see and experience, the smarter or warier that carp will be in the future. It doesn't really matter to the final result of a great photo and release experience, whether the carp ends up with the plastic hook bait inside its mouth because the plastic bait was specifically targeted by the carp, or it ended up in the mouth inadvertently because the carp was feeding on the accompanying or nearby free bait offerings.